Aurora predictor for tonight. See the two charts below. Read on for more information about viewing sites and science information. I was about to go to bed at about 10pm. I noticed the sky behind the trees was unusually bright so I called Olivier, from France, who is staying at Huon Bush Retreats. A few hundred metres to the labyrinth gave us a clear view of the southern sky, where the Aurora was active. Not a spectacular show this night but a subtle green glow with just a hint of a few pulsing red beams. When can I see the Southern Aurora Lights ? Auroras are somewhat random natural phenomena. As such, they cannot be predicted accurately. 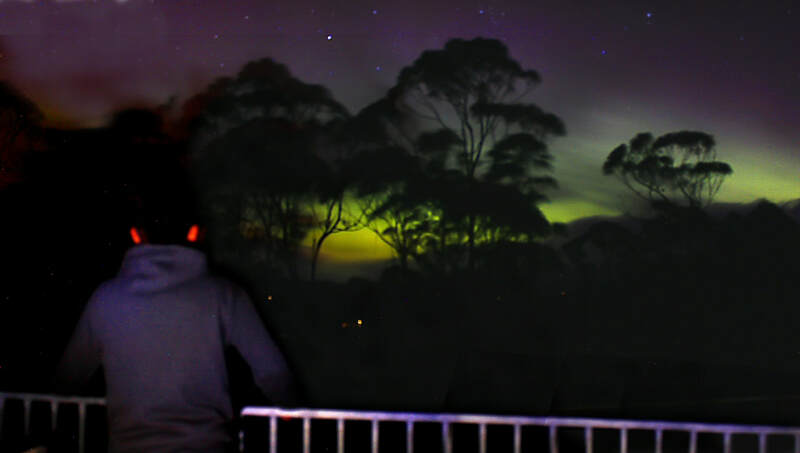 Questions such as "when is the best time to see the Southern Lights" cannot be answered accurately. However over time, statistical likelihood can be used as a guide to plan your visit to increase your chances of seeing the Aurora. Displays come and go. As short as a few minutes, sometimes many hours. The longer you look, the better your chances. The sample image below, shows the current extent and position of the auroral oval in the southern hemisphere, extrapolated from measurements taken during the most recent polar pass of the NOAA POES satellite. 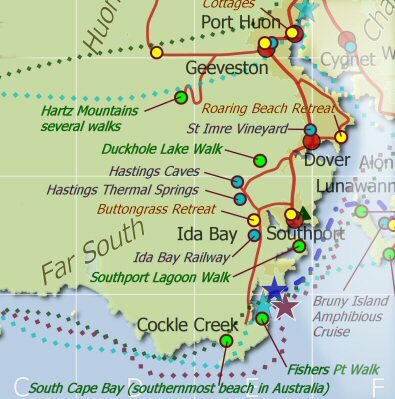 Find the outline of Tasmania in the bottom left of the image. If it has green colour over it, then the aurora will be visible. 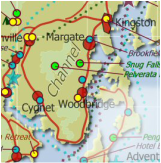 The red line in the plot indicated the northernmost extent of view. Further down the page is the real time predictor for tonight. The image above shows the Aurora prediction for the next hour or so. Click button below for the next 24 hours. 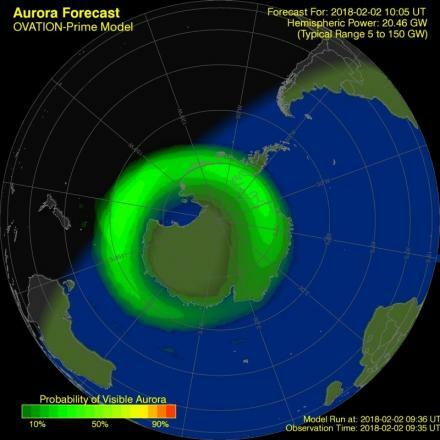 The Auroral Forecast product is based on the OVATION Prime model which provides a 30-40 minute forecast on the location and probability of auroral displays for both the northern and southern polar regions. The statistical pattern depicting the auroral oval is appropriate to the auroral activity level determined from the power flux observed during the most recent polar satellite pass. The power fluxes in the statistical pattern are color coded on a scale from 0 to 10 ergs .cm-2.sec-1 according to the color bar on the right. 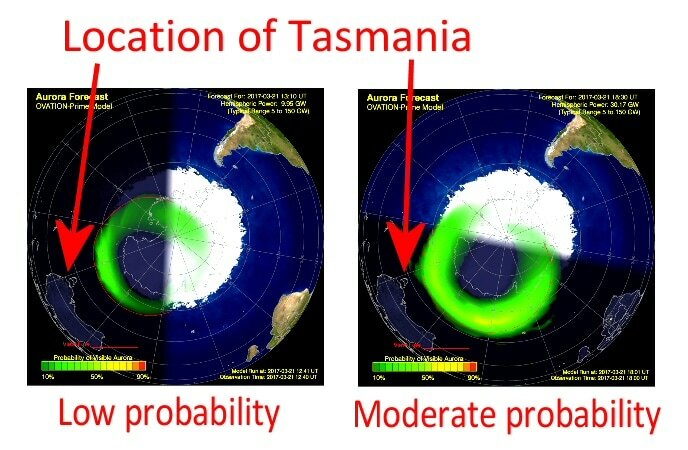 This presentation provides an estimate of the possibility that the aurora is located near a given location in the southern hemisphere under the conditions that existed at the time of the most recent polar satellite pass. 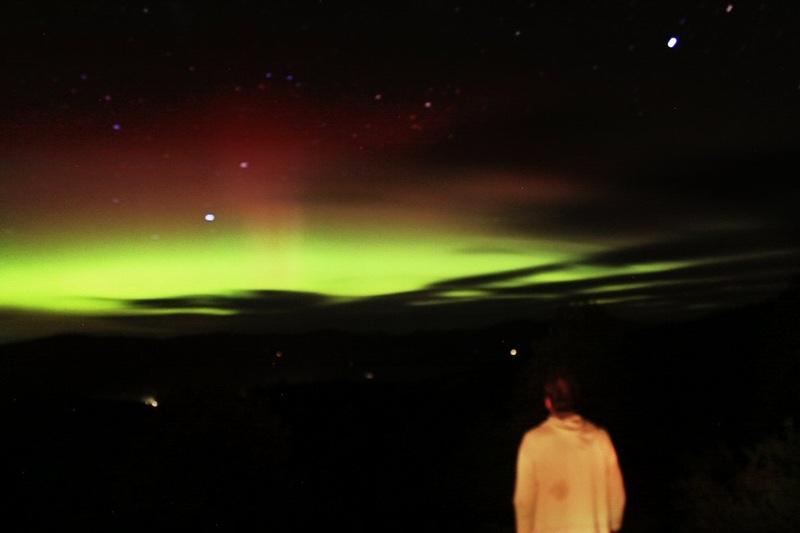 The Aurora Australis, also known as Southern Lights, is sometimes seen in the southern sky from much of Tasmania. The best places are those with open sky to the south and no city lights. 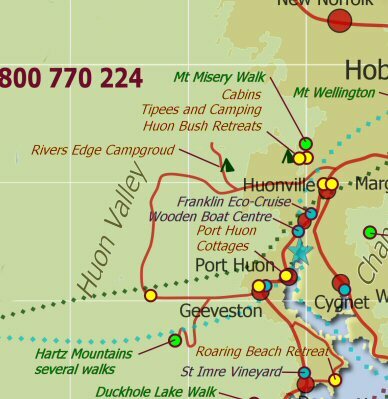 Buttongrass Retreat, Port Huon Cottages and Clifftop Cabin at Huon Bush Retreats are all suitable on an aurora active night. NOTE: There are NO tours to see the Southern Lights. 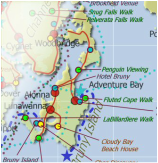 There are accommodation locations where you can get the best chance of seeing the lights from your cabin but no one can guarantee a tour to see the Aurora. Several Huon Valley Escapes properties have views to the south. Come for the waterways, wilderness and wildlife that we have on display every day. maybe you get lucky and see an Aurora as a bonus. Clifftop Cabin at Huon Bush Retreats has a perfect south view and dark sky. A few town lights, might get an Aurora view on a good night. 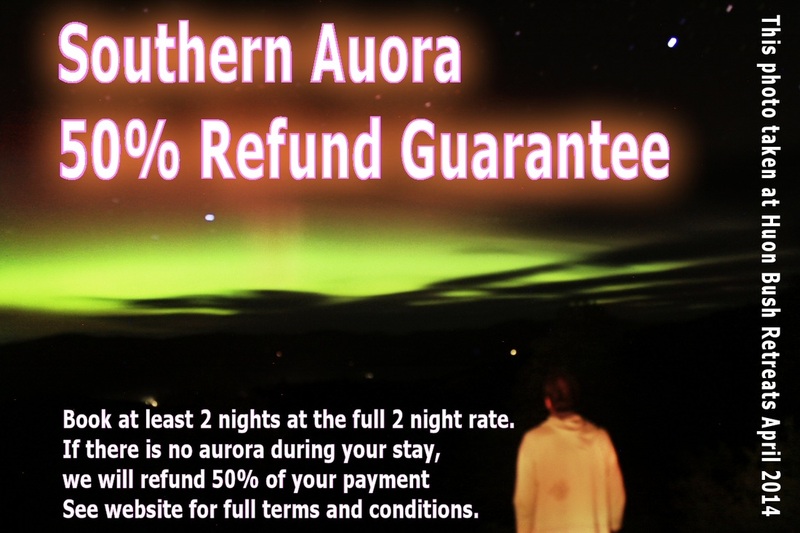 Also, see our Aurora refund guarantee below. 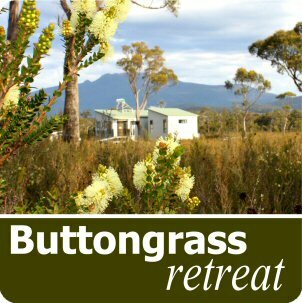 Book and pay two nights at the discounted multi night rate, in Clifftop Cabin at Huon Bush Retreats, Monday to Thursday nights during the low season months each year (excludes Friday, Saturday and Sunday nights). Full payment is required at time of booking, no changes or refunds except as per these conditions. You must book at least 2 nights at the already discounted multi night rate. This guarantee is not available in conjunction with any other discount rates or vouchers. This event was in the past but it might be of historical interest to you.